Sumit Guha was born on December 12, 1970 in Calcutta, India, to his mother Gita Guha, and father Asit Guha. He grew up in Calcutta, and was always an excellent student. He enjoyed playing cricket, reading, and being a loving son to his parents. With the support of a very well educated family, his commitment to excellence, his perseverance and resourcefulness, Sumit completed his university studies with a degree in physics. Sumit’s professional life led him to Mumbai, where he worked in the film industry as an audio technician, and a Sound Consultant for Dolby Laboratories. He loved his job, and was proud to be part of an industry that allowed him to work side by side with colleagues respected around the world. 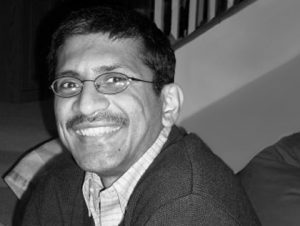 In 2008, Sumit relocated to Vancouver, where he joined the projection team at the Vancouver International Film Festival, and the Vancity Theatre. Sumit quickly became a projection expert without peer, but more importantly, he was a calm and steady presence in a sometimes very chaotic environment. Sumit loved his adopted city of Vancouver, he loved his family, his work, and his friends. The power and scale of the love that was directed right back at him, can never be equaled. At the young age of 44, Sumit died on April 19, 2015 after a brief but cruel struggle with HLH. His passing left a hole in the hearts of all who knew him. Everyone will miss his skills, but so much more importantly, everyone will miss the essence of the man that was Sumit – a gentle soul who will be irreplaceable. Sumit’s name means “good friend,” and knowing him meant having your life enriched. Family, friends and colleagues will miss his humour, his smile, his compassion, his talent, his spirituality, his reverence, his inspiration, and his friendship. The Hemophagocytic Lymphohistiocytosis (HLH) Care Fund was established at UBC to raise money for research into HLH. Your gift to this fund will pay tribute to Sumit’s memory while helping to support other patients faced with this condition. HLH is a rare condition whereby certain white blood cells (histiocytes and lymphocytes) build up in organs including the skin, spleen, and liver, and destroy other blood cells. This causes severe inflammation and damage to many organs including the brain, liver, bone marrow and the lymphatic system. HLH may be inherited or caused by certain conditions or diseases including infections and immunodeficiency (inability of the body to fight infections). Presently, little is known about the disorder. Further research is needed to develop a better understanding of the disease, so that more effective treatments can be developed. Donations will support UBC researchers to create specialized tests – currently unavailable in BC – to help diagnose and manage HLH so that future patients have the best possible health outcomes. Sumit is deeply missed by all who knew him. Please make a gift in memory of his life and help researchers make inroads into this devastating disease. I feel honoured to have known and worked with Sumit. He was so kind and sweet and I miss him still. But tale of days in goodness spent." He came, He conquered (our hearts) and He left. As someone very closely related to him, I had the privilege of knowing him from close quarters. Although I am his father's cousin but due to his being just one and a half year younger to me, he was more of a kindred soul to me. I will always remember him as a beautiful soul and a blithe spirit, who always set the highest standards in whatever he did, be it academics or professional work, but most important was that he did it in his own unique style and gentle manner. His impeccable manners ensured that he never ruffled any feathers, yet his dependable presence and unique insight was always there in times of need. Once again when I look at his smiling face, a lot of wonderful memories keep flooding back. Thanks for the wonderful times that I had spent with you. R.I.P. Bubun. Dundun was an indelible part of the first 18 years of my life - we were born two weeks apart, and rarely spent two weeks away from each other. I never saw him without a smile in his eyes, nor a harsh word on his lips. He was truly a gentle soul. When we moved to college, we lost touch and it is a matter of great regret that we never reconnected although deep down I always believed we somehow would. My heart goes out to his family, who were once part of my family - may he rest in peace. I was privileged enough to work with Sumit at The Cinematheque. As we all will, I remember him as a true professional. Working with him you knew you could count on him for anything and everything, including warmth and support. His presence was always so reassuring. I had the utmost respect for him. He was so kind, so sincere, so genuine. He was a very special person whom I think of often and remember fondly. Sumit was a gentle and shining light, and we at VIFF miss him dearly. His extraordinary presence and valuable expertise are no longer with us, but what he put in place survives, and his spirit shines on in our memories. It is very rare to meet a person of few words but who was so lovely and helping at heart. Always with a smile on his face, there has never been a moment I have seen him ponder over issues at hand. He was always jovial. May you remain that way friend. 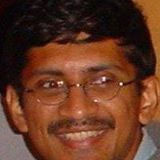 Sumit was my cousin and I have not known a more gentle, kind, responsible and patient person. He was a man of few words but his presence was always reassuring. He would go out of his way to help people, and this attitude of his has changed quite a few lives for the better. What I appreciated most about him that, although he was very very quiet, he loved life and enjoyed fun things. There was no negativity in him. It's sad that one who never hurt anybody had to suffer so much the last few weeks of his life. He will be missed by all who knew him. It's more than 25 years since I met a bright yet soothing Sun along with it's solar system.The Sun was named Swami Jaidevanandaji.There were many bright planets around him.But I was fascinated by one who was' intensely calm in the midst of intense activity'.In other words he was serenity personified.Those who have known him will easily understand that I'm talking of Sumit Guha.It is impossible for me to describe his unique personality.So the best thing to do is to keep quiet while looking at his broadly smiling face which exudes peace all around. It's hard to find words to express the sadness I feel at Sumit's loss, particularly to this cruel disease that took him away so quickly and at such a young age. His value to VIFF and Vancity Theatre was immense - but that value was not just in his technical expertise and his desire to learn as much as possible about his craft. He was an example to us all about grace under pressure, stopping to listen to and learn from the people he met, and always presenting a outward calmness even when under extreme pressure and facing urgent deadlines. It's hard for me to go into our projection booth here at the theatre and not find Sumit there, but I will always see him there. We miss you very much, Sumit! I met Sumit during our many events where I divided my time between Emily Carr University, SPark CG SOciety and SIGGRAPH. I was always pleased to include Sumit in the planning, and asking his thoughts on a range of topics. He was a most gentle and thoughtful person. I remember he went so above and beyond to help a filmmaker in France who he hadn't ever met, to get her film to work. He never failed to try absolutely everything to help creatives and filmmakers achieve their visions. I've only heard fantastic feedback from presenters and filmmakers experiences with Sumit both within his job and also his personality. He was inspiring to be around. I am so happy to have known him! Sumit was the loveliest person to work with and it's an honour to contribute to the HLH Fund at UBC in his name. Sumit as a person was very quiet and conversed very little. In the realm of nature, a flower in its full bloom never talks but with its beauty, fragrance and tenderness embalms our body and mind. To me Sumit was like that. My sister and I know Sumit as "Dundun da" (the suffix "da" is used in Bengal for an older brother). My mother and his aunt were colleagues who became very close friends. Both families were drawn into the bond and now consider each other family. I remember us leaving his aunt and cousin Tiuli di's house one evening many years ago, only to find our car refusing to move. She was a stout old Ambassador who had been given a face lift but needed a nudge and a push once a while. It so happened that that evening was "once a while". As we looked at our car, ready to roll up our sleeves, Dundun da came out of the house. Our story was greeted with those deep dimples-- he had the most beautiful smile. And, in that signature quiet manner he pushed the car along. This was before he moved to Canada, but the memory flashed in my mind each time we spoke about him. I remember Dundun da by his smile-- that's the picture that will stay with all of us. Thank you for making it possible to share that moment. Sumit was my twin in age; we both were born to two sisters a month and ten days apart. From toddlers to teens, much of our lives were spent very closely together till Sumit went away for his studies and later work. My house at Kolkata used to be where he came every single day with his mom ( my aunt) whenever he was here. Sumit was a very beautiful boy with dimples and lovely eyes. He grew up to be a beautiful soul. This year when I bid goodbye to him, I held his hand and said: You had a very tough stay at India this time and next time you will be absolutely fine. I did not know it would be the last I would see him. Deep appreciation to Matt and Ingrid for this initiative.